New Jersey's new Democratic governor, Phil Murphy, is seeking to rejoin a regional pact aimed at reducing carbon emissions from power plants in the northeastern United States. The Regional Greenhouse Gas Initiative is a consortium of nine eastern and New England states that has achieved substantial emissions reductions from large power plants since its start in 2009. The initiative was the brainchild of a Republican, then-New York Gov. George Pataki, who began championing reducing greenhouse gas emission in the region in 2003. Despite its pedigree, former New Jersey Gov. Chris Christie walked away from the agreement in 2011, claiming it was ineffective and that his state was already reducing its emissions by replacing coal with natural gas to meet its energy needs. The state legislature voted twice to return the state to the Initiative, but in both cases the bills were dead on arrival on the governor's desk. Meanwhile environmentalists began a sustained campaign -- a campaign that included litigation -- arguing that numerous studies had shown power plant emissions had already declined 40 percent by the time Christie pulled the plug on the program, and that it had raised $2.7 billion that member states were actively reinvesting in energy efficiency measures and a wide array of renewables. Gov. 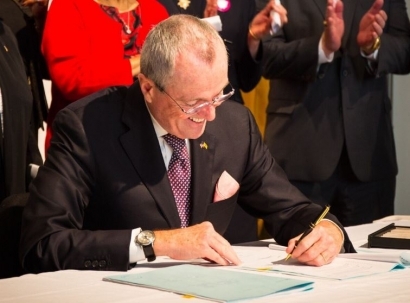 Murphy signed an executive order in January to put New Jersey back in the group, but the Initiative's memorandum of understanding requires that member states agree to let non-members join. On Monday, Murphy announced he had sent the members a letter formally seeking their approval. The Governor went on to note he has already instructed the N.J. Department of Environmental Protection and Board of Public Utilities to open discussions with the member states as soon as practical. “As a recognized national leader on environmental protection and as a coastal state, it is imperative that New Jersey resume its rightful place as a leader in combating climate change and sea-level rise,” said DEP Acting Commissioner Catherine McCabe in a written statement. “At the DEP, we are moving forward aggressively with the necessary steps to rejoin RGGI as soon as possible. This process will fully engage all stakeholders and the public, and will be conducted with ample outreach and public education,” McCabe said. Murphy wanted New jersey to be completely powered by renewable energy by 2050, arguing the shift away from fossil fuels will strengthen New Jersey’s economy. The Regional Greenhouse Gas Initiative is the nation’s first multi-state, market-based cap-and-trade program designed to reduce emissions of carbon dioxide from power plants. Participants allocate, award and transfer carbon allowances through an auction process as an annual carbon-dioxide cap declines. This encourages more market efficiencies, development of renewable energy, and technological improvements for power plants. Proceeds from the auctions are disbursed to states for a variety of programs including energy efficiency assistance for consumers, renewable energy, greenhouse gas abatement and electricity bill assistance. Murphy has directed that future allocation of auction proceeds will include an emphasis on projects that serve communities that are disproportionally impacted by the effects of environmental degradation and climate change. The Regional Greenhouse Gas Initiative's current members are the states of Delaware, Connecticut, Maine, Massachusetts, Maryland, New Hampshire, New York, Rhode Island and Vermont.